“The motorbikes came streaming down the Corso, their light beams diffused by fog into iridescent halos, each a perfect miniature of the colored ring that appeared around the moon on rare occasions, an effect of ice crystals. In the clouds. Score of moon rings laced and interlaced. Valera knew they were cycles with riders, but all he saw was glowing rings. They sent a seditious crackle through the air, those headlights, promising that something would happen. 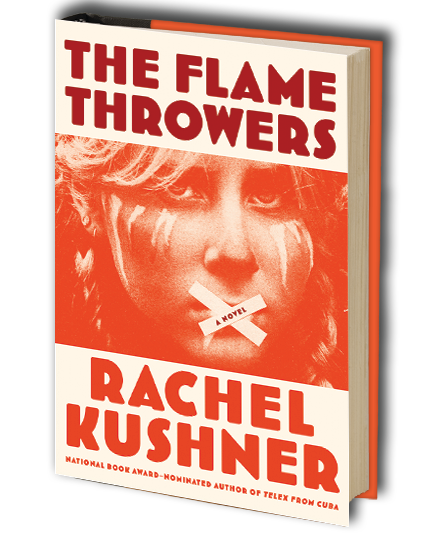 Rachel Kushner’s The Flamethrowers (Scribner, 2013) is a vivid sensory plunge into the cultural insecurity and instability of the mid-1970’s. It is primarily the story of Reno, an aspiring artist and motorcycle enthusiast who makes her way into a fairly exclusive company of emerging SoHo, New York artists; her relationship with her boyfriend, Sandro, established artist and heir to the Italian Valera motorcycle company; and the cast of avant-garde characters surrounding them. As Reno and Sandro’s romance disintegrates, Reno finds herself stranded in Italy with a radical group of protesters, and she becomes part of something more dangerous than she could have imagined. The richness of the novel can’t be captured in a simple summary, though, for the story is as much about the frailty and depth of human connection, the Zeitgeist of the era, what it means to pursue art, the struggle for identity, and simply about the writing itself. The plot doesn’t always speed along, nor is the significance of each piece of it always even evident. But it is for the most part engrossing: I was enchanted by the shiny chrome and the zoom of the motorcycles and by descriptions of the SoHo art scene that were by turns seductive and infuriating, and unsettled by the palpably simmering backdrop of political and social unrest, both foreign and domestic. I loved roaming vicariously through the streets of New York, zipping across the salt flats of Nevada, and traveling to Italian countryside villas and the gritty neighborhoods of urban Rome. There is also an intriguing secondary plotline (from which I selected the excerpt above) - the story of Sandro’s father, founder of the Valera motorcycle company. As his story from the past races toward Reno’s story in the present, we feel the influence of history in both the personal lives of the characters as well as in the political and social context in which they exist. One is left with the sense that there might be such a thing as destiny. "Novels can—should—mirror the non-coherence of the world. Rarely do I relate when a writer utilizes narrative structure to force reconciliation. For me, truth cracks open in the places where things do not cohere. That’s how life is. Rupture and incoherence of parts, which stream into understanding. I guess my intention with the form—what I think the form can do—is stream what doesn’t fit into a frequency of some kind, not a plot of some kind. I would prefer to let the reader deal with holding together what fits because it is in one book, and not because the writer tried to make parts cohere in a symphonic logic." So if you pick this one up, be prepared to open yourself to many ideas and also some ambiguity. And if you do, enjoy every moment of it - there is a lot of great writing to savor, and some to feel challenged by, but without a doubt it will give you plenty to think about. My copy of The Flamethrowers came from the public library. Happy reading! Took a few chapters to get into it, but this was such a pleasure to read. Enjoyed going along for this interesting and wild ride...felt like I was "right there" in these worlds that my sedate life will prevent me from ever experiencing. I am so glad I read this! 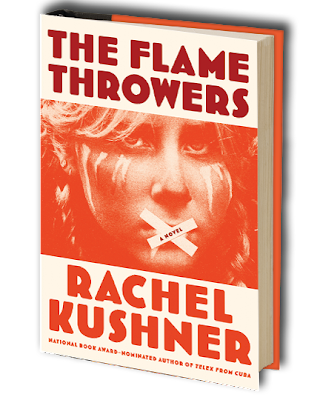 Rachel Kushner has many valuable things that she says with this novel - about art, and gender, and identity...among other things. This review sounds a little more negative than I meant it to, but its purpose is to encourage readers to stick with a sometimes difficult read. I know that I'm glad that I did.